Prothane's Polyurethane Ball Joint Boots are much more durable than stock rubber boots and will keep debris, moisture, and dirt out of your ball joints for life. Find the ball joint boots for your vehicle below. The protective boots that come standard on your original ball joints are made of rubber which becomes brittle with age and fall apart or can tear when under extreme stress. Imagine dumping sand into that joint and driving down the road while the metal ball stud grinds away at the bearing surface, which could be made of plastic in some cases. Not a pretty picture. An easy and inexpensive replacement for those doomed rubber boots are Prothane's Polyurethane Dust Boots. Polyurethane is much more durable than rubber and retains it's flexibility as it ages. 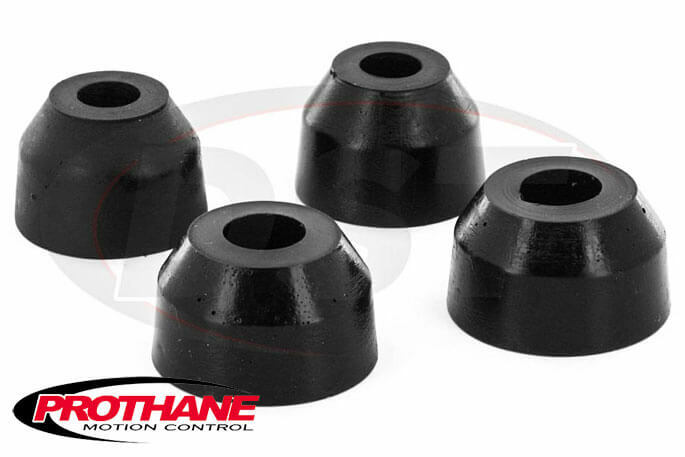 Prothane's ball joint boots are under warranty to last the life of your vehicle, while rubber boots will almost certainly need to be replaced at some point. If you are especially hard on a work truck, or if your daily commute takes you over over mud or salted roads, then these poly boots could actually extend the life of your ball joints by keeping wear-accelerating contaminates out, saving you money down the road. * If you're unable to find a boot for your vehicle or have aftermarket ball joints please contact the helpful DST customer service folks or check our handy Prothane Universal Dust Boot page for instructions on measuring your ball joints and selecting a Prothane boot for your application.